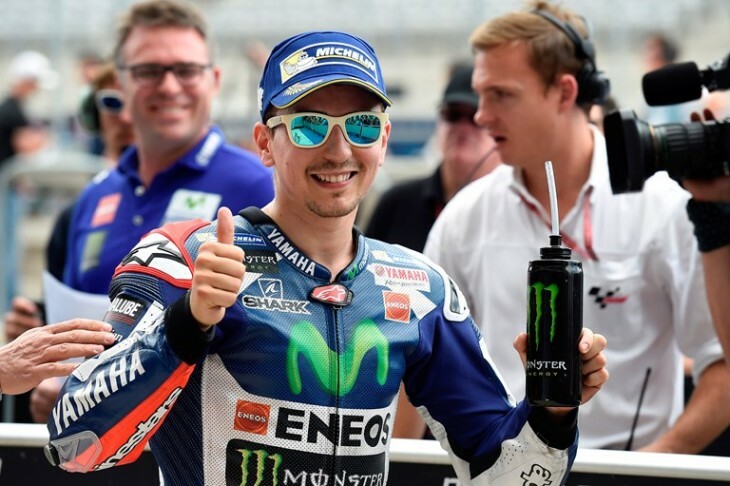 Movistar Yamaha MotoGP riders Jorge Lorenzo and Valentino Rossi made it count in a heated qualifying session this afternoon, scoring second and third respectively on the front row of the grid for tomorrow’s Grand Prix of the Americas. A determined build up in pace beginning from yesterday’s free practice sessions by Movistar Yamaha MotoGP riders Jorge Lorenzo and Valentino Rossi saw the pair fly to second and third respectively this afternoon in qualifying at the COTA circuit for tomorrow’s Grand Prix of the Americas. Lorenzo was straight to business in the 15 minute qualifying heat, first out on track and head down to put the first time on the board, slotting in at the top with a 2’03.613s lap. The Spaniard then returned immediately to the pits to evaluate his next move. It took until eight minutes remaining on the clock for rival Marc Marquez to challenge for the top spot, motivating Lorenzo to return to the track with a fresh rear to accept the challenge. He was immediately able to raise his game, scoring a 2’03.257s in the hunt for pole, coming just 0.069 from the front man. The time was to stand to the end of the session, keeping Lorenzo on the front row in second place for tomorrow’s race and very much within reach of his rival on pole. Teammate Rossi chose to hold back at the start of the qualifying session, allowing the field to move out and ahead to provide clear space for his high speed run. The first shot on qualifying rubber got the Italian nine-time world champion up to speed, taking a 2’05.780s lap. Having warmed up Rossi then put the hammer down and shot up the top ranking to take third with 2’04.355s effort. With six minutes to go he then returned to the pits for new rubber before making a final challenge. Whilst in the pits, fellow Italian Andrea Ianonne had moved up to take third, bumping Rossi down to fourth. The move was quickly rebuffed with Rossi striking back in the last moments of the session, dropping under the ’04 mark with a 2’03.664s to retake his front row slot alongside his teammate Lorenzo for the big show tomorrow. Monster Yamaha Tech3 team rider Bradley Smith produced a spirited performance in qualifying today after working relentlessly to turn around his fortunes in Texas. The 25-year-old began the day by carrying on his efforts as he fought his way around the physical and meandering circuit before finishing with a time that meant he would contest in QP1. Here, he got straight up to speed and posted an impressive lap that was over a second quicker than his personal best in FP3. The strong time marked a significant improvement for Smith who worked closely with his team in preparation of the following 15-minute shootout. When it commenced, the Briton continued where he left off and eventually powered to a time that will see him begin the Grand Prix from the middle of the fourth row. The 2015 fastest satellite rider now has his sights set on sealing a top tier finish in tomorrow’s 21 lap race. On the other side of the Monster Yamaha Tech3 Team pit box, Pol Espargaro came agonisingly close to competing in QP2 twice, but just fell short after giving his all in two highly competitive MotoGP sessions. The young Spaniard kicked off his day by further adjusting the setup of his Yamaha YZR-M1 during FP3 and he missed out on the cut off to QP 2 by a blink of an eye and a mere 0.014 of a second. When the first qualifying practice commenced, Espargaro leapt forward and quickly set about speeding to a top lap. After pushing non-stop, he closed the session with a time that was just 0.018 from second, meaning that he will start the third round of the MotoGP World Championship from the head of the 5th row on the starting grid. Nevertheless, Espargaro intends to fight all the way to the chequered flag with the aim to join his teammate in the battle for the top independent rider position.